Kia Ricchi's current work focuses on coral reefs and their inhabitants. 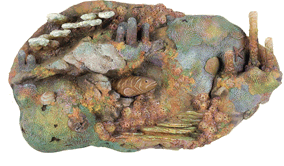 Home on the Reef is a sculpted wall relief. Kia has captured the vibrant splendor of a tropical coral reef in this spectacular piece. Hole for One is a sculpted table with a uniquely shaped glass top. These ornate and lifelike creation will delight both marine lovers and art enthusiasts, and the carved concrete technique allows for indoor and outdoor placement. Through these works, Kia hopes to share her passion for the underwater habitat and increase awareness of this fragile ecosystem.